It's that time again. 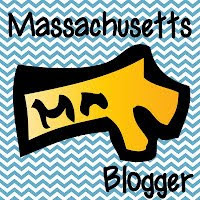 One of my students several years ago called it "The Nightmare of Fourth Grade." 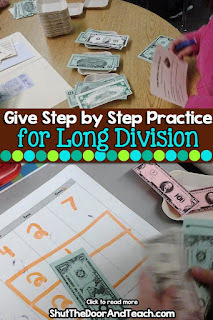 Fourth grade teachers know what math concept I'm talking about: Long Division. 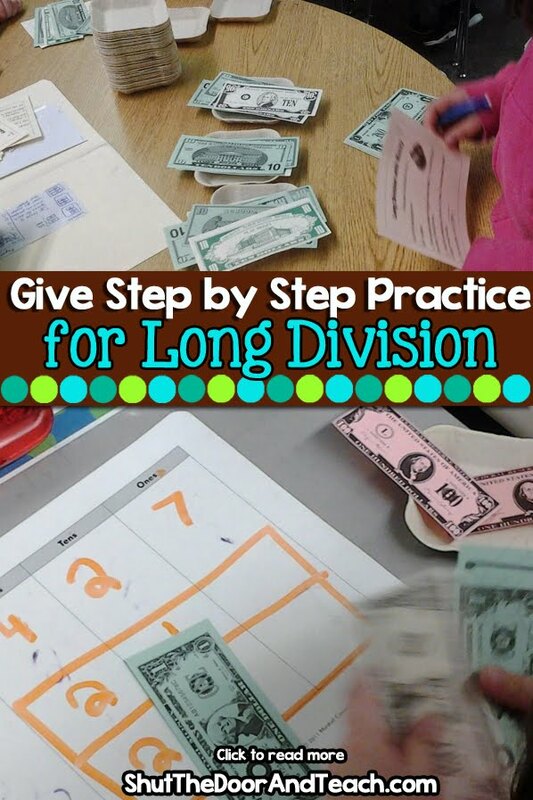 Nowadays there are different ways to approach teaching long division. I've tried the partial quotient method and I find that it's great for some learners. However I like to take a different approach. 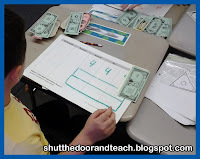 Math in Focus puts a lot of emphasis on place value at the start of the year. It's also very important in Chapter 2 when we estimate and in the first part of Chapter 3 when we multiply 2 digits by 2 digits. 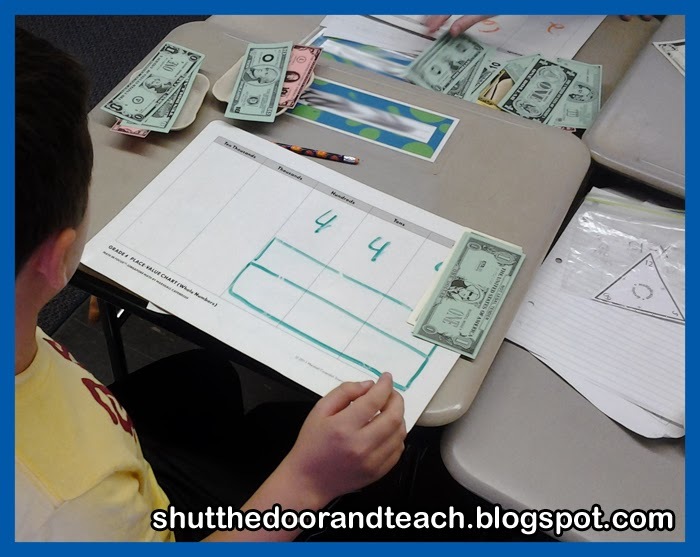 So in my mind the best way to tackle long division is to use what the kids have been learning about place value. And the best way to do that is with money. 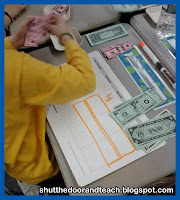 To start out, we break out the place value mats and write a dividend at the top. 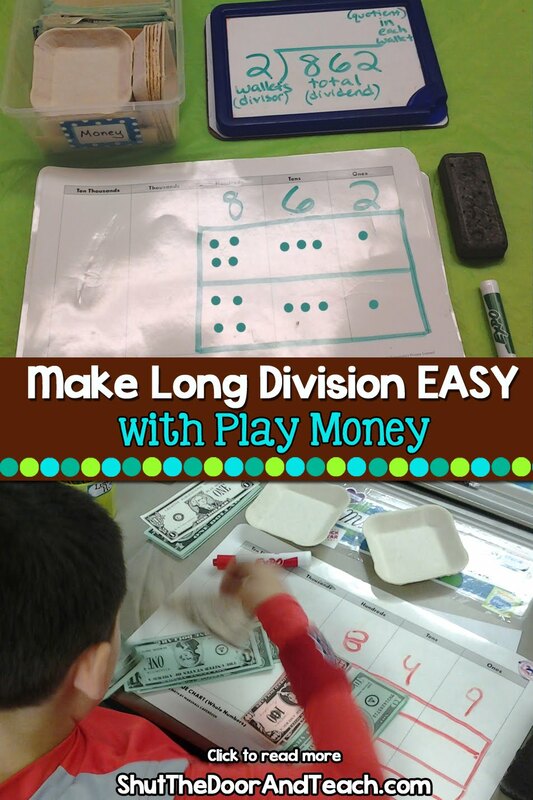 Then I teach them that another way to think of the divisor is "the number of wallets" they are splitting the money into. In the first example, I make sure that the numbers divide evenly which is a huge confidence booster for kids who have heard "horror stories" about long division form their older siblings. They get a preview of a column of numbers underneath the numbers in the standard algorithm and shut down. We don't get into ANY of that on day one. 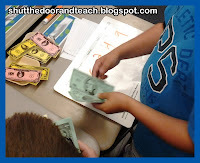 We stick with the manipulatives and it's as easy as dealing cards. Split the hundreds, split the tens, and split the ones. Count the total in a single wallet and you have your quotient. As an aside, I COULD use place value chips that come with Math in Focus, or I could use the base ten blocks. But I like using money better because I feel like it's a "real world" manipulative that kids can relate to better. 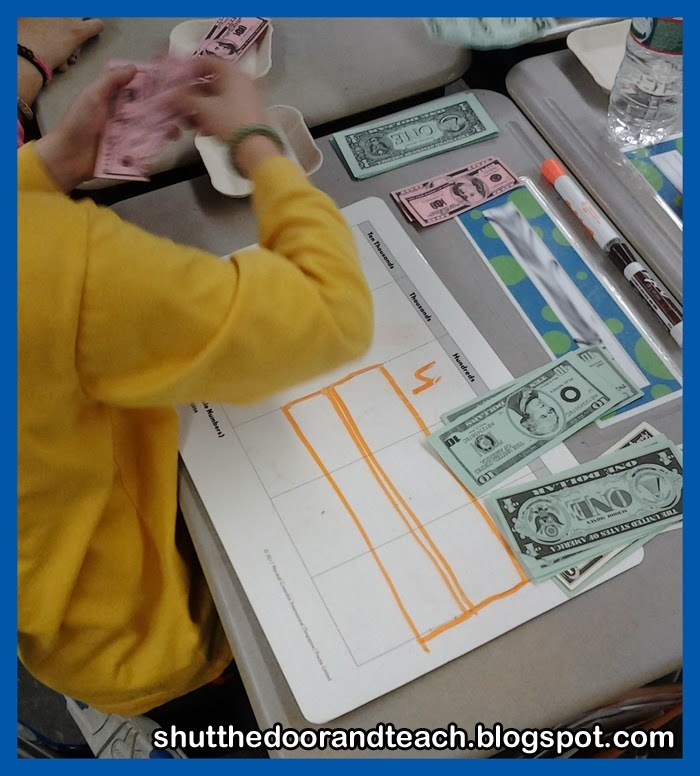 Plus there's just something about the feeling of counting dollar bills that motivates a lot more people than plastic blocks! Ooooh, that created a buzz. Surely numbers with remainders in the quotient are REALLY HARD! But I was ready for them. "I can show you how to do that right now; it's not a big deal." And all I did was increase the ones place by 1 to create a new number, 863. I went through the process again, only this time I wrote "r 1" at the end. Suddenly remainders are easy. I changes a few of my original problems to have a remainder of 1 or 2 so the kids could practice the challenge they made for themselves, and they took it in stride with no issues. Next time I'll show you how we regroup with the money in order to tackle those problems like 762 divided by 2. 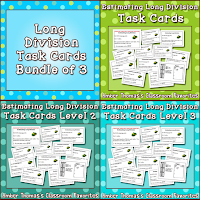 If you can't wait, you can preview my long division task cards bundle product. 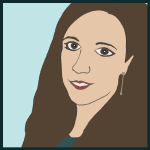 It has 3 different levels of difficulty so you can differentiate to different learners in your class.